Precise and durable, with your choice of stylized text. Select your embosser below by entering the quantity to order next to your desired embosser. You must also select the desired options for that embosser. Our Deluxe Pocket Seals are the finest in the industry! Item #dps-ct No other Embosser looks like it or works like it! 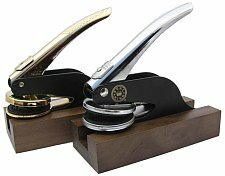 The all new Cobra Pocket Embosser has an ergonomically improved contoured frame and handle designed to fit comfortably in the hand. 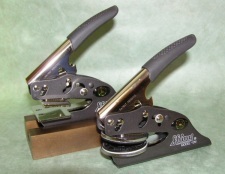 The leveraged handle requires less grip force compared to our standard hand held embosser. Reach: 1 3/4 inch from center of impression. Designed for 20 - 30 lb standard bond paper and SealKing™ Premium Foil Seals. 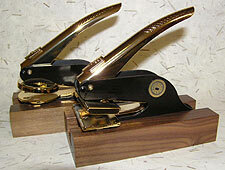 Item #jsp-ct Beautiful custom brass handle and insert. Comes with deluxe padded case. Reach: 1 3/4 inch from center of impression. Designed for 20 - 30 lb standard bond paper and SealKing™ Premium Foil Seals. Optional solid walnut base. Gold accent 1 5/8 inch - $59.98 $49.98 - Free Shipping ! 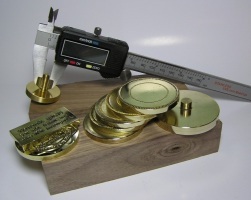 Item #skd-ct Our Deluxe SealKing™ Pocket Seals are the finest in the industry! The Deluxe SealKing™ Pocket Seal offers a heavy duty frame and precision parts for the finest impressions every time. Easy sliding mechanism makes for convenient handling and storage. Comes with a Deluxe Padded Case.